Atheists sometimes claim that they represent reason and that Christianity is anti-intellectual and inherently unreasonable. 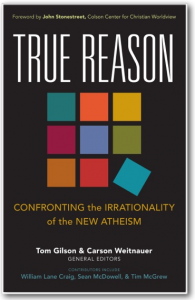 True Reason, a collection of 18 essays, discusses this idea and meets atheists’ arguments head on…if they have presented arguments that can be reasoned with; otherwise True Reason points out their lack of logic and careful thought. Sometimes deep, sometimes almost humorous, but always insightful and logical, the contributors to this volume discuss issues such as Dawkin’s ideas, Project Reason, the Argument from Reason, the emptiness of naturalism, the relationship between faith and reason, the problem of evil, and the relationship between science and Christianity. Over and over, I kept nodding my head. Yes, there is a great deal more reason in believing that God exists than in believing only those things that can be demonstrated by objective, empirical, preferably scientific evidence. This is especially true since, without God, there is no philosophical ground to accept any of such evidence as valid. In fact, without God there is no basis for either reason or evidence. Although not acknowledged by the New Atheists, this is not a new concept and it has long plagued unbelieving scientists, mathematicians, and philosophers. He is right. It matters deeply and eternally, and that is why this book is important. True Reason can help Christians talk to those who are genuinely searching for the truth about God, although, sadly, no human persuasion will ever convince those who do not want to believe. For, according to their own writings, atheists often have strong emotional—not reasonable, evidence-based, or logical—reasons for not wanting God to exist. As a homeschooling mom, I was considering this book for the upper high school years. For many teens, it will be a bit too complex, although those with a classical education or who have studied logic should be able to follow it. On the other hand, parents of thinking teens and of university students would do well to read this book and understand it. It could help them equip their children to stand up for their faith against popular but unfounded attacks. On the whole, I was able to agree with most of the contributors to this volume. However, a few of them seemed to be skirting the edges of orthodoxy, which may indeed be inevitable when countering great falsehoods. For this reason, I would not want to hand this book to a questioning teen without having read it myself—although I would highly recommend that parents read it with their questioning teens. The bottom line: I recommend this book for adults and thinking teens, especially those interested science, philosophy, or apologetics. To see for yourself, check out this excerpt. This is the kind of book I would recommend for your teen’s science and math reading, with guidance. This is yet another book in the in the 2014 52 Books in 52 Weeks Challenge and is also linked to Saturday Reviews and Trivium Tuesdays. Disclosure: An electronic copy of book has been provided by Kregel for the purpose of this review; the review represents my own honest opinions. This book sounds really helpful! Thanks for the recomendation!